Experience optimum temperature control and reliability when you connect with natural gas. Budding home chefs will enjoy this cost effective energy option! Plus, unlike an electric cooktop, you’ll be able to turn up the heat in an instant. With a huge range of gas appliances including cooktops, freestanding and wall mounted ovens, you’ll soon be cooking like the professionals at home. 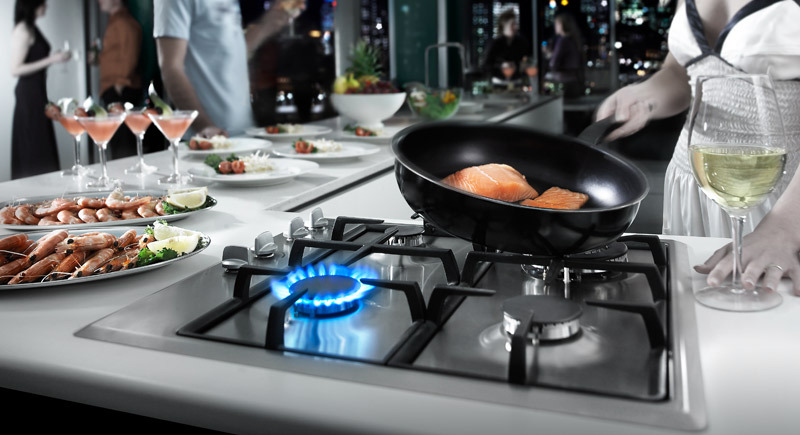 Chefs love a gas cooktop as they're quickest and most efficient way to cook. If you enjoy cooking Asian food, consider adding a wok feature to your stove top. With a wok cradle you'll get fast and authentic results, so that you can enjoy the delicious flavors of your food faster. Grill tasty snags and delicious burgers with a gas-connected BBQ or outdoor cooker. With an unlimited gas connection you won't need to worry about refilling bottles or checking gas supply levels. The only thing you'll need to keep an eye on is the steak! Gas ovens heat up quicker than your standard electric models and are more humid. This is due to the combustion of the gas releasing moisture into the air of the oven. As a result you'll enjoy perfectly crispy crackling and golden brown baked goods. Contact one of our participating rebate suppliers. They'll do the work you need (e.g. supply and/or install your chosen natural gas appliance), and then facilitate rebate payments from us to you - easy! We have a network of over 500 participating rebate suppliers, and you can get in touch with these suppliers using our online directory. You can lodge your claim directly with us via our cashback website. You'll need to make sure you have everything installed and connected before you lodge a claim with us. Approved rebates will be paid as cashbacks via Electronic Funds Transfer - straight to your nominated bank account. This is a first for us, so we're excited to offer this to our customers! Wondering how much you’ll save if you decide to make the switch? Our case studies show how natural gas is a great option for customers in Victoria and South Australia and demonstrate how you can save money, have unlimited hot water and reduce your emissions. Natural gas offers Australians a low-emission alternative to electricity generated from coal. Natural gas hot water systems provide instant and reliable hot water, with less carbon emissions than electric hot water systems. Gas vs. Electricity - What's best for you? When it comes to powering your home, choosing between gas and electricity is one of the biggest decision you’ll make. Whether it’s the price of energy, the efficiency of appliances, or your home’s carbon footprint, there are several things to consider when making your choice.